I really love this feature and use it frequently. 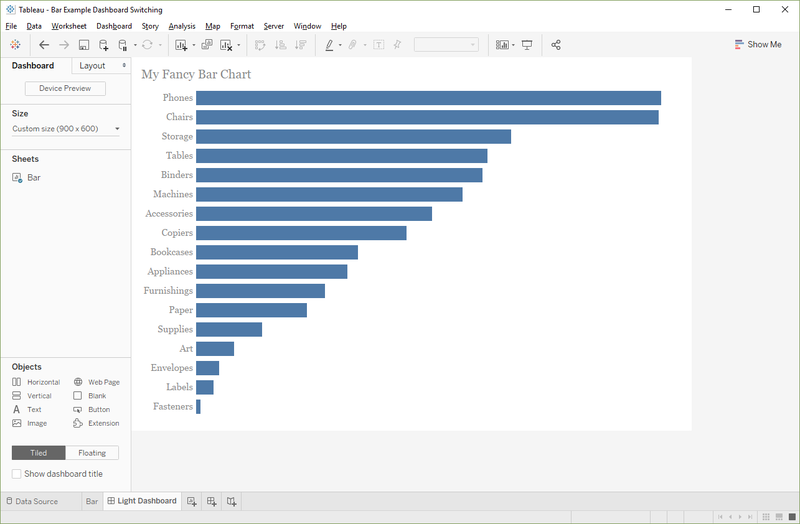 So, I’ve always wanted to be able to do this in Tableau. Last year, I attempted to do this and was moderately successful as you can see in the animated gif below (or you can explore the full visualization here: Crumbling Infrastructure). I started to write about how to do this, but it was just too damn complicated. It required the use of multiple floating containers which each performed its own sheet swap. Because filter backgrounds could not be transparent, you couldn’t use filters, so I ended up creating toggles (each a separate sheet with their own sheet swapping) and I had to be really careful about alignment and padding so that things were just right. In the end, I decided to just hold on that blog post until transparent sheets were available. Now that 2018.3 delivers the oft-requested feature of transparent sheets, this process becomes a bit easier. But it’s still a bit tricky, so follow along closely. 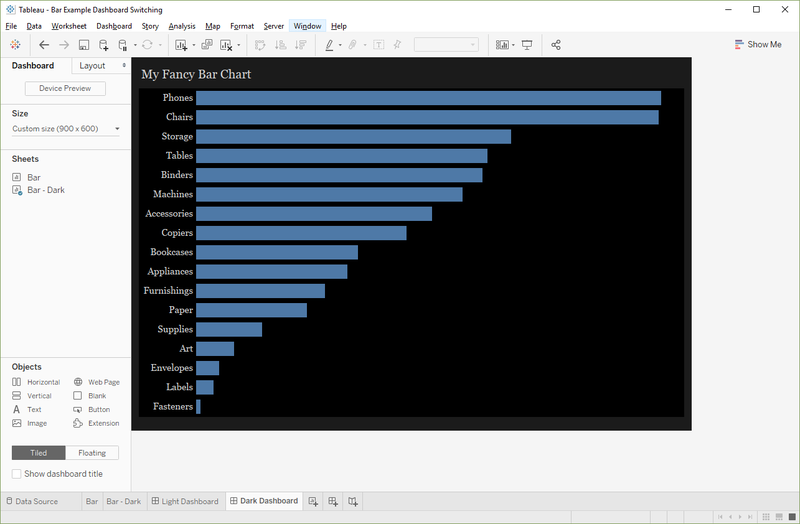 Let’s start by creating a simple bar chart using the Superstore data set. 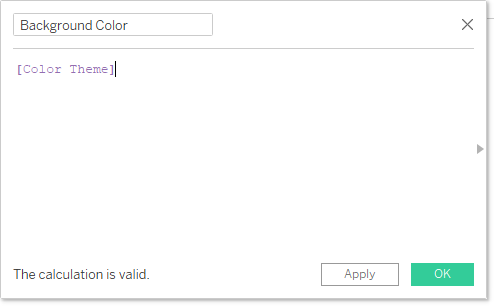 Format the sheet so that the background color is “None.” This will make it transparent. Hold onto this sheet and we’ll come back to it later. Then create a calculated field that simply references the parameter value. Create a bogus measure on both the rows or columns shelf. Just set both values to 0. Change the mark type to a circle. Change the color opacity to 0% in order to make the mark invisible. Finally, change the background color. 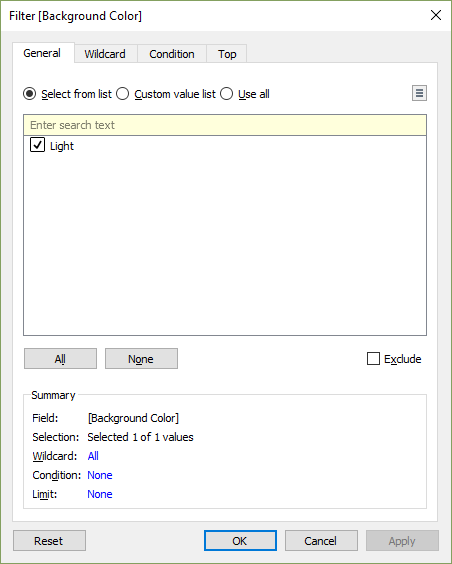 Then do the same with the Dark Background sheet, filtering it to only the “Dark” option. Next, we’ll create a dashboard. We’ll leverage a sheet swapping technique to swap between our light and dark background sheets. There are a number of different sheet swapping techniques available, but I’m partial to the one written by Hashu Shenkar from the Data School, Tableau Tip: Switch between views dynamically on a dashboard. If you haven’t done this before, then go read this blog before moving on. We’ll start by dragging over a vertical container. In the Item Hierarchy, choose “Tiled” then set all of the padding to 0. This will ensure that none of the dashboard background color will show. We’re almost done, so hang on with me! 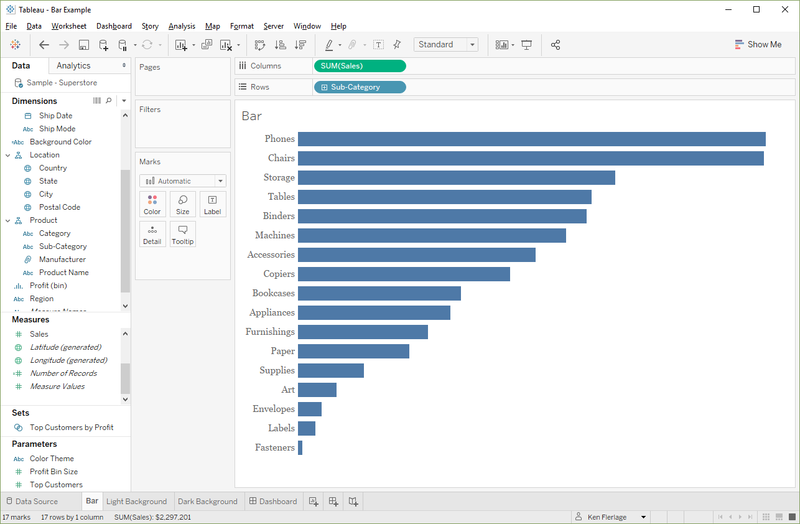 Now float the bar chart worksheet onto the dashboard. 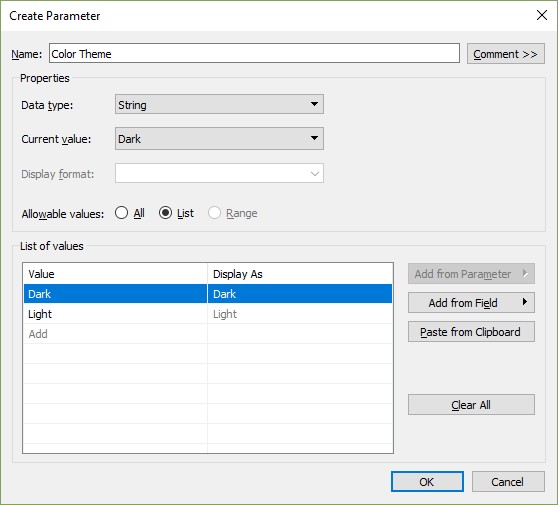 Because we previously made the sheet’s background transparent, we’ll retain the background color based on the parameter. One of the problems you’ll notice, however, is that the fonts won’t always work well with both backgrounds. The simplest solution to this problem is to choose somewhat neutral fonts—ones that will look fairly good on both a light and dark background. Middle-of-the-road greys seem to work fairly well. You’ll also want to make sure that the color of the marks on your chart work well with your background (you could also control these using the parameter, if you like). After finishing this blog, I sent it to my brother, Kevin Flerlage, and asked him to review it to make sure it all made sense. He gave me the thumbs up, but then suggested another possible solution—why not create separate versions of the dashboard, each with its own color theme, then use dashboard buttons (also a new feature in 2018.3) to jump from one dashboard to the other. What a great idea! Thanks Kev!! So, here’s how you can use this method. Here’s the good news. 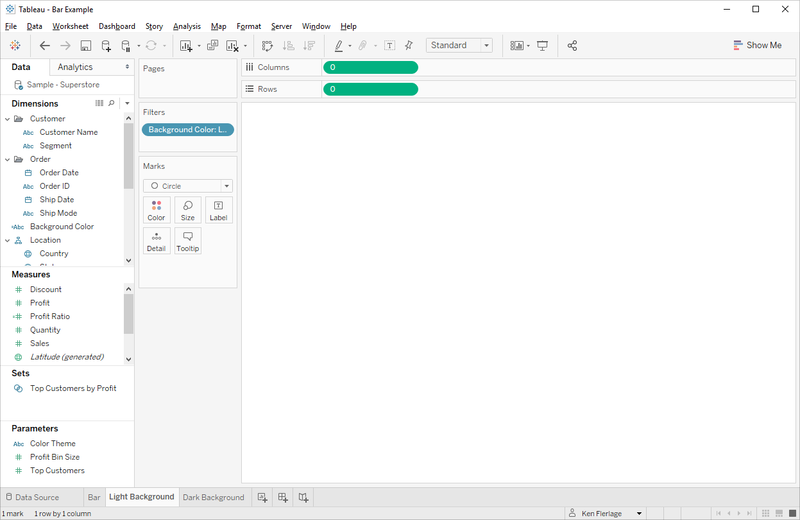 Since these are totally separate sheets and dashboards, we can customize the font colors as desired—there is no need to choose a neutral font that works with both background colors. Next, we need to set up a mechanism for flipping between the two dashboards. We can’t use a parameter, unfortunately, because parameters cannot trigger an action to switch tabs. So, our best option is to use buttons, as noted earlier. 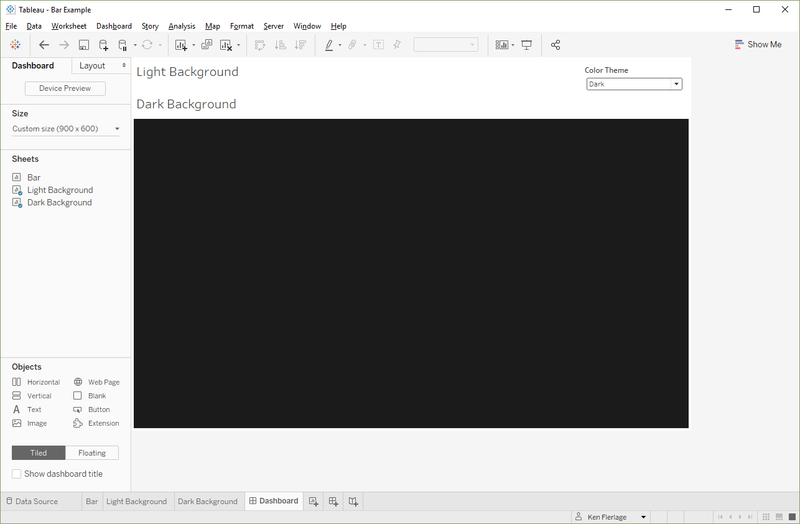 Float a button onto the light background dashboard and configure it to navigate to the dark dashboard. 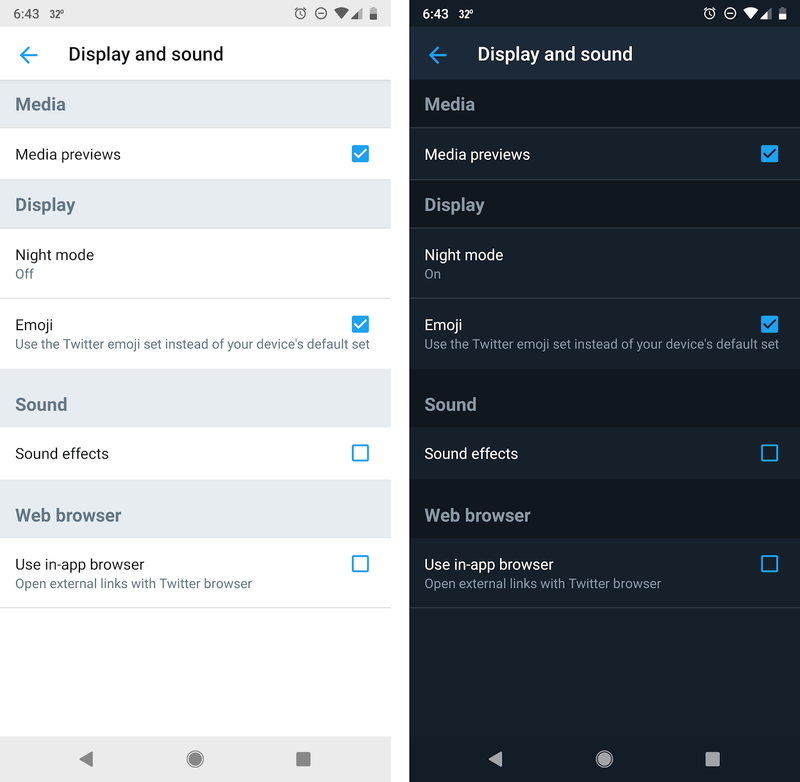 As mentioned previously, in my original, pre-2018.3 attempt at adding color theming, I used toggle images, so we’ll use those here as well so that it looks like we’re toggling on and off the dark mode (just like apps on a phone). For the light dashboard, we’ll use the “off” position of the toggle. Note: I've created two different sets of toggle images which you can use. You can find the images here. Of course you can create your own as well. Next, we’ll create a toggle on the dark dashboard. We’ll place it in the same position and make it the same size as the toggle on the light dashboard (you can use the Layout pane to get this information). We’ll set it to navigate to the light dashboard and we’ll use the “on” toggle image. With that in place, we now have a fully functional color themed dashboard. So, which of these two methods should you choose if you want to add color theming to your dashboard? I suppose it depends. 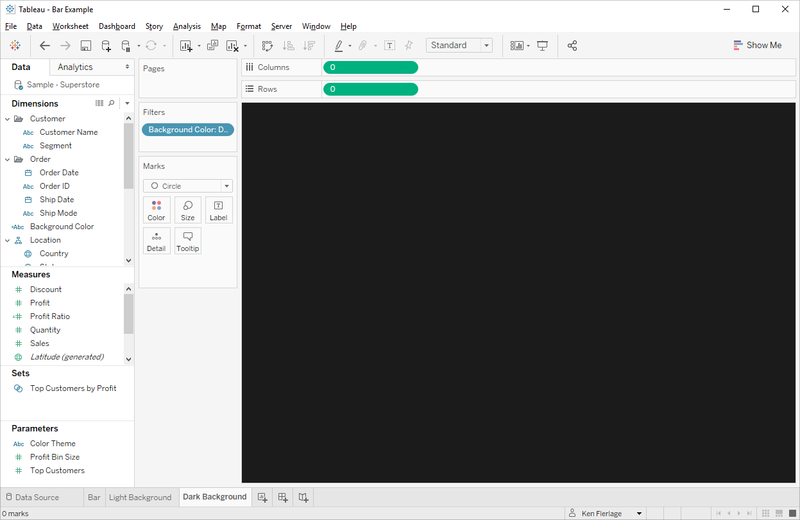 The dashboard switching method is really nice because it’s much easier than the first method and it allows for a lot more flexibility in font colors. In addition, this method has lots of other potential applications—essentially you can perform complete dashboard swapping, much like the commonly used sheet swapping method I referenced earlier. 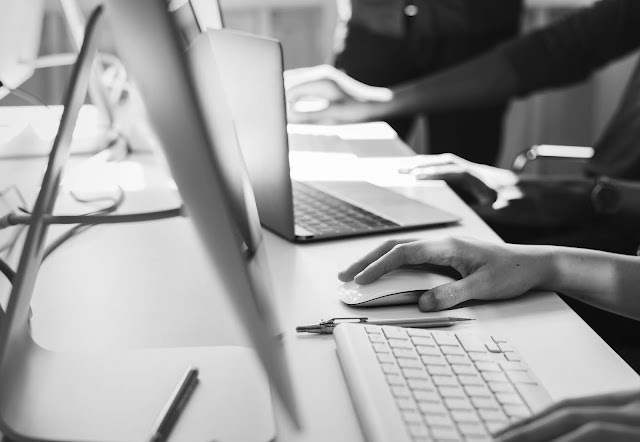 However, this method also requires you to maintain multiple copies each worksheet, which could become onerous if you have multiple worksheets. So, think about your use case ahead of time and pick the option that works best for you. Before we wrap this up, let’s ask a question—why should you ever use this? Is it just something cool or can it be of some tangible value to our users? It’s certainly a bit more work than using a single background color, but in certain circumstances, it could be quite valuable. I recently attended a short seminar on accessibility and the speaker told us that many people with low vision—a generalized condition where a person has lost a certain amount of their eyesight—often have light sensitivity. By reducing the amount of light that enters their corneas, they are able to enhance their vision. Thus, darker color schemes can make something much easier for them to read because they reduce the amount of light so significantly. So, while color themes on apps and software (and visualizations) may just seem like a neat little trick, it’s a feature that can also be quite helpful to make that tool consumable by a wider audience. And, in my opinion, that’s always a good thing. Thanks for reading! If you have any thoughts, feel free to leave them in the comments section below. Note: If you saw my recent post on Wind Roses, you might have noticed that I used this technique in one of the final visualizations, so go check it out!